and had to take photos! heck, there’s only about 1/2 a loaf of 2 left! crawling across the paving stones. then i thought, hello! it’s 4 in the morning! get out the hose in the morning! >That pumpkin bread looks so good, pass me a slice. You are such a good mom, at my house is choc chip cookie dough straight out the container. >Oh, how I wish you would have taken a shot of those worms. Mostly because I’d love to see what kind of light you’d get at 4am:)GREAT pumpkin bread and seriously…you deserve a mommy medal. I think you can tell a lot about a person through these blog things and to me, you’re an outstanding mom!!! >You’re too funny! I had to LOL when I read about the 4am episode. Yup. I think I’m obsessed too. Yesterday I was at a crop and I couldn’t wait to go home (I left early) to try and “develop” some shots I had left in RAW. What’s gotten over us??? ?Anyway, your bread looks good. I agree it’s a bit dark but heck, you did the shot. And I agree, you should get a medal for being a great mom. I hardly want to cook after I come home from work, much less am I going to want to make dessert. As it is we end up eating out 3-4 nights during the week…Great job you’re doing there.And I know all about the troubles of eating during lent’s Friday’s. I think the girls are tired of tuna since that’s all they eat. At least you were able to “change” the menu ;)You DD shot at the game is cool. Her hair does look funny but that’s the best part of it. She was “in” the game. Great job with the action shot. The ball suspended in the air is pretty cool.And on to my favorite entry this week. Those bottles are great!!!!! I want to do some. I LOVE THEM!! Can you give me directions as to how you glued the paper and ribbon to the bottle? Is your bunny a die cut or a free-hand design? And as far as the photography…well I love how you placed them against a black background. They totally pop and they look so creative.Your strawberries shot is good. Nice and even color and good composition. My youngest DD loves to eat strawberries. She can go through an entire pint in one sitting if we let her. We even call her “strawberry shortcake” because she loves them and she’s short. Me? I’d eat them like you, dipped in chocolate…lots of chocolate …And I hope your co-workers didn’t think you were a weirdo for taking pics of their lunches…And yes, school lunches are full of “undentified” stuff…gotta love them huh? I think my fellow teachers would’ve freaked out if I shot their lunches, but they know me…I AM weird.Oh and your cookies…I gave up cookies for lent so I won’t even go there…stay away temptation…. 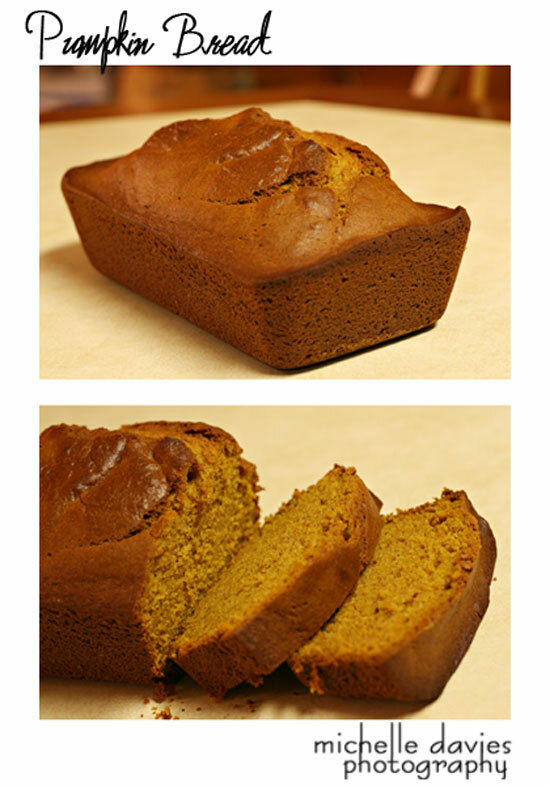 >yum… the pumpkin bread looks delish. It is a bit dark, but it still looks so good. >oh, and yes… i am that obsessed. I was outside looking for slugs tonight. Wouldn’t you just guess………NONE. Any other time there’d be slugs, but NO, not this week!!! lol.